Ok, we didn't document day-to-day photos and journals, so bare with me with the time frames of when things were done. I'm basically just going in the order they we uploaded onto my computer. We do however know every feeling we had and have while looking at these pictures, so I'll try to be very descriptive in our feelings about these times. Everyone loves talking about their feelings, right? These next few days, we had lots of time spent with family, so not the most productive time. Mark (Tommy's dad -- you'll see his name a lot in here so try to remember who he is!) kindly helped and taught Tommy the beginning lessons in making cabinetry. This little corner nook was supposed to be a place solely for dog stuff, food, bowls, etc. The oven and stove have been removed to paint them white, and all the original cabinetry has gone to the dump. Mark & Tommy broke down slabs of maple that Mark had at the house already, and made thin lightweight slats to handmade these cabinets. Tools used during this process: table saw, miter saw, kreg tool, belt sander, orbital sander, and wood screws. Sorry, I don't have more photos of this process. I was at Disney on Ice with my nieces! Over the next few days we ripped out the rest of the carpeting and ordered new LED marker lights and taillights for the RV, and were on the hunt for a porthole for above the stove area. There used to be a microwave above the stove that we got rid of, and an oven hood (oven hood we kept). Every time we felt like we were making substantial progress we would find something new that needed to be repaired to move forward. The newest find, soft spots on the subfloor. 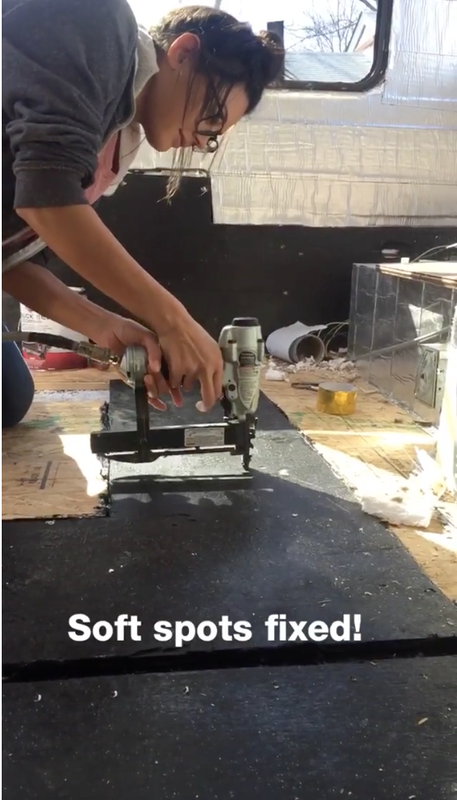 We found 4 or 5 soft spots from water damage on our subfloor, so we had to fix them to move forward with insulating our floors. We cutout the soft spots and then replaced them with new particle board painted in truck bed liner to protect the wood from any new potential water damage. Sorry for the photo quality, I had to pull this from a video we took.